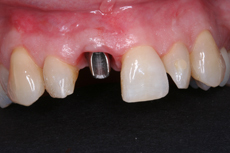 Dental Implants have become first choice for many people. 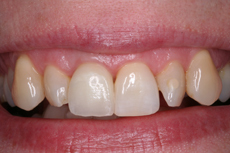 Appearance in the front of the mouth is very important and it is essential to produce a tooth that looks natural and at the same time to create gum contours that are very similar to those of adjacent teeth. This is bulky and can compromise other teeth by stopping the natural cleansing of teeth by soft tissues and saliva. This leads to possible gum problems and tooth decay. These are an improvement but can inhibit the natural cleansing and often have visible clasp arms. 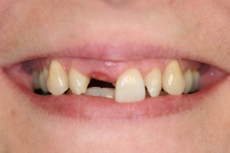 This option has the advantage of being simple to provide and doesn’t harm your other teeth. However it always carries the risk of falling out if the glue is not strong enough – particularly if someone has a heavy bite. Also the metal wings that are glued to the adjacent teeth tend to make the teeth it is stuck to look grey. This option can be very predictable. 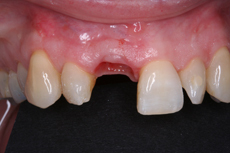 However perfect teeth need to be cut down to support the bridge and can cause more problems with them later. With this type of treatment adjacent teeth are not damaged and implant placement stops further loss of bone height in the area. Implants have become first choice for many people.